KIEM asks Eureka Fair Wage Act proponent James Decker some pertinent questions about raising the minimum wage to $12 in Eureka – and gets some straight answers. While you are there take the poll! It is said that we don’t need a minimum wage, that a minimum wage causes unemployment, that if the minimum wage were lower – or completely eliminated – then employers could afford to hire more workers. It is said often that this is “supply and demand” and an ironclad “law of economics.” It is of course an argument designed to appeal to the simpler minded half of the gene pool. Yet two facts confront us. One, the real purchasing power in constant dollar terms of the minimum wage has declined for 45 years, so there has been a de facto “lowering” of the minimum wage, and Two, we currently have a very persistent and high level of unemployment. The laboratory of life has proved this favorite Chamber of Commerce meme to be a fabrication that is nowhere near real life economics. We conclude that the theory that lowering the minimum wage increases employment is FALSE. People welcome to the meetings even if you live outside of Eureka. The Fair Wage folks urge you to get involved in passing the Eureka Fair Wage Act, also known as the Minimum Wage Ordinance. If passed through a popular vote, the Act would require large employers with 25 or more workers in Eureka to pay a $12 dollar minimum wage. A higher minimum wage, with a small business exception, will improve lives, make Walmart reconsider its presence in Eureka, boost the local economy, bring employment up, and allow individuals who work full time to rise just above the federal poverty level. Meetings for the Eureka Fair Wage Act are now every Wednesday at 6:15pm at the Eureka Labor Temple, 840 E Street. More information can be found and questions answered by visiting the Eureka Fair Wage Act website, fairwages.org, or by calling 707-442-7465. If you are interested in helping the campaign in any way, wherever you live, please get in contact. 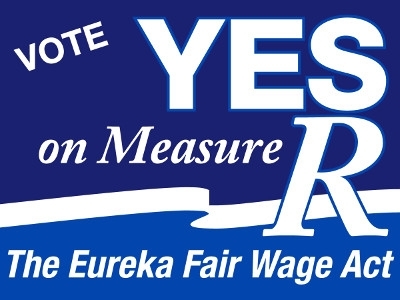 The Eureka Fair Wage campaign is delighted that we easily surpassed the 10% signature threshold, guaranteeing ballot access for the Eureka Fair Wage Act. We believe, however, and hope to prove, that we gathered enough signatures to cross the 15% threshold which would put the Fair Wage Act on a ballot even sooner. Please come out to the Eureka City Council meeting at 6:00pm, Tuesday March 19 and show your support for the Eureka Fair Wage Act. The Fair Wage Act (or “Minimum Wage Ordinance”) will be on the agenda. The City Council has the option, again, to listen to the needs of the people and simply pass the Act, raising the minimum wage for large employers to pay their workers in Eureka. If the Council does not, we will continue organizing and pass the initiative at the ballot box! 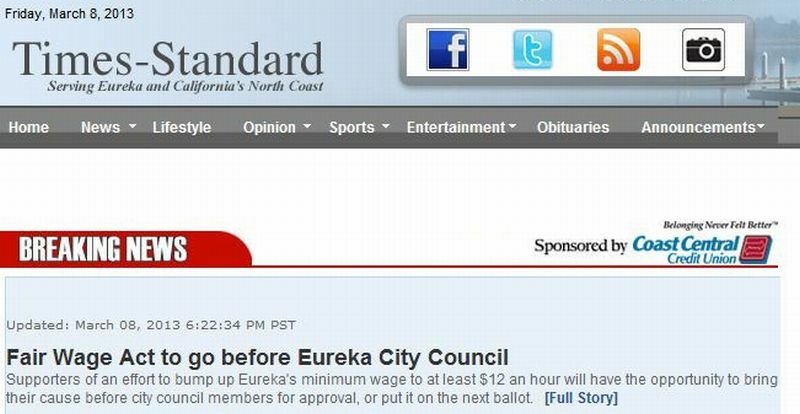 A petition to boost Eureka’s minimum wage to $12 an hour has received enough valid signatures to be presented to the City Council at its March 19 meeting. “In the wealthiest nation on Earth,” President Obama declared in his State of the Union speech, “no one who works full-time should have to live in poverty.” Right! Not only does his call to raise America’s minimum wage put some real pop in populism, but it could finally start putting some ethics back in our country’s much-celebrated, (but rarely-honored) “work ethic.” Kudos to Obama for putting good economics and good morals together – and for putting this long overdue increase on the front burner. But then came the number: $9 an hour. Excuse me, Mr. President, but that means a person who “works full-time” would nonetheless “have to live in poverty.” Yes, nine bucks is a buck-seventy-five better than the current pay, but it’s still a poverty wage, and it doesn’t even elevate the buying power of our wage floor back to where it was in 1968.